Footscray is home to a number of excellent Vietnamese haunts, including the popular Nhu Lan Bakery. Heaving crowds queue here in the mornings for their daily banh mi – a flakey baguette filled with hot meat, delicate crunchy vegetables, nuoc mam sauce and chilli. The ingredients merge perfectly with the fluffy centre of the baguette, which is slathered in chicken liver pate. The queues can get a bit crazy, but the staff get through orders at an impressive pace. Grab a barbequed pork roll, and head to the Little Saigon Market for your fruit and veggie needs. For your coffee fix, head to the Footscray Milking Station on Bunbury Street. Aptly named, the cafe was once a milking station and the surrounding area once paddocks full of grazing cows. 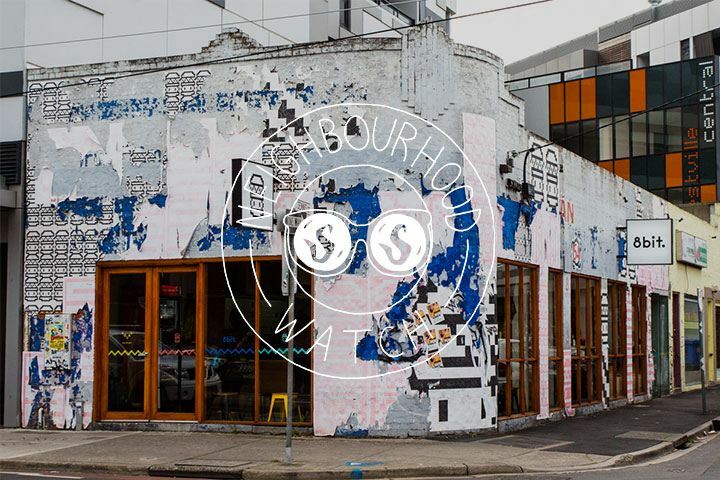 Today, owners Aven Watson and Jessica Tumbri use an eclectic mix of recycled materials to fit out the cafe, bringing an urban community vibe to the area. Kristy Halloway serves as Head Barista, and she is dedicated to producing the perfect cup. The Footscray Milking Station uses Padre’s Seasonal Espresso Blend, which is rich and full-bodied with notes of malt, toffee, almond and cocoa. The blend uses consistently delicious Colombian and Indian coffees as a base and finds balance through the addition of South American and African single origins. For lunch, make your way to the corner of Denis and Droop to 8bit, where Alan Sam and Shayne McCallum flip some of the best burgers in town. The diner is marked by a huge pixelated burger on its side, and the childhood theme continues inside. Take a seat in one of the brightly coloured chairs for a feast of American proportions. Try the Traditional 8bit with cheese, complete with a beef patty, tomato, lettuce, red onion, pickles, mustard, cheese and 8bit sauce. Pair it with a serve of chilli cheese fries, which are loaded with jalapeños, beef and cheese sauce. If you’re still not full, finish the meal off with a peanut butter or strawberry cheesecake milkshake. By late afternoon, you’ll probably be in need of a drink and a snack. It’s time to head to the Plough Hotel for a wine and board of cheese. Taking a departure from the traditional pub grub, the Plough Hotel offers smaller plates like zucchini and chia seed falafels with tahini yoghurt, twice-baked goat’s cheese soufflé with asparagus and tarragon, and confit tuna with avocado, tomato, white anchovy and caperberries. There are also freshly shucked oysters, and charcuterie boards of cured meats, house-made terrine and Pyengana aged cheddar – perfect piled up on brioche and toasted sourdough. As the sun sets and the temperature drops, it’ll be time for something quick, comforting and warm. Our recommendation: a bowl of pasta from Fox in the Corn. The food is cooked and prepared at the owners’ Millgrove Pasta factory in Williamstown, and the focus is on simple, high quality fare. The menu concept is basic: start with a few entrees, pick a type of pasta (there’s ravioli or fettuccine) and a sauce to match. There are a dozen or so sauces to choose from, such as creamy mushroom with leek and garlic panko; or pork belly with vegetable broth, winter veg and peas. Wash the meal down with something from the wine list, or one of the eight rotating craft beers on tap.